Itaúna Beach in Saquarema attracts surfers from all around Brazil. A big rock to the left assures waves almost all year round. National and international competitions are held here. The town itself has close to 65.000 inhabitants. The easiest way is just to catch a bus from the bus station in Rio. 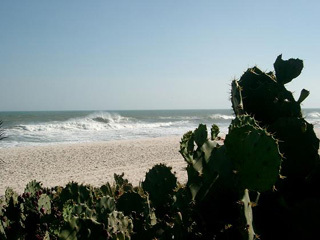 It takes about two hours, check the timetables on the site 1001, that is the bus company that operate this stretch of the coast, you can also find out their timetables for Cabo Frio, Arraial do Cabo and Búzios on that site. If you want to have information where you can buy your bus tickets in advance (a good idea Fridays, holidays and during high season) just click here. How to get to and from the bus station you find out by clicking here. There are quite a few options for accommodation but if you’re here to surf you want to be close to Itaúna Beach. There are hostels and pousadas in this area, some of them on the beach. When you get off the bus don’t walk over the bridge, take a left and you will soon be there. Since there are a few restaurants here as well you actually never have to leave this area. The church Igreja Nossa Senhora de Nazareth is beautifully located on a hill overlooking the sea. It is well worth a visit, you get really good sunsets from up here. To say that there is only surfing in Saquarema is not true. There are also possibilities to do para gliding and hang gliding. You have hiking and they offer trips to the mountains where you can make shorter rafting excursions. On the lake they have pedal boats and you can rent jet-skis.